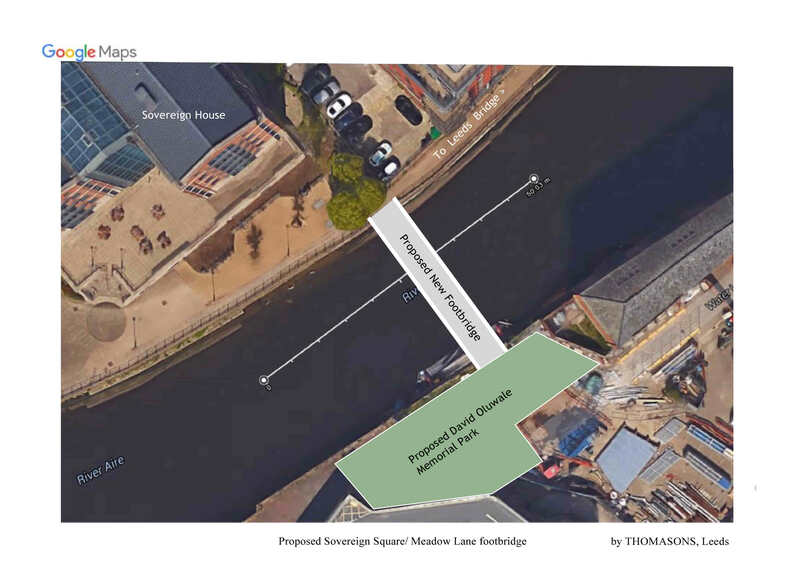 Proposal for a footbridge to connect the Sovereign Square public space with the south side of the river. 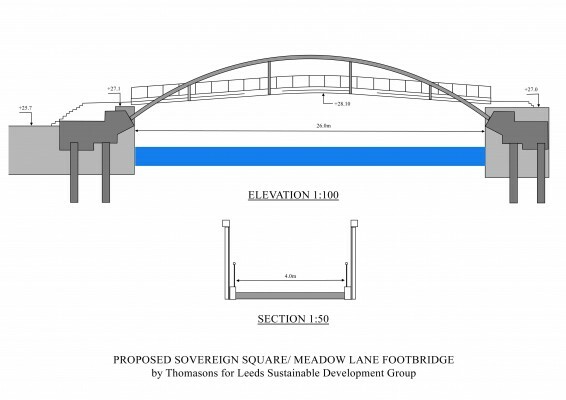 As part of the redevelopment of the south bank of the River Aire in Leeds city centre a new footbridge is proposed across the river to link Sovereign Square on the north bank to the area of the proposed new David Oluwale Memorial Park on the south bank (just east of the present Asda car park). 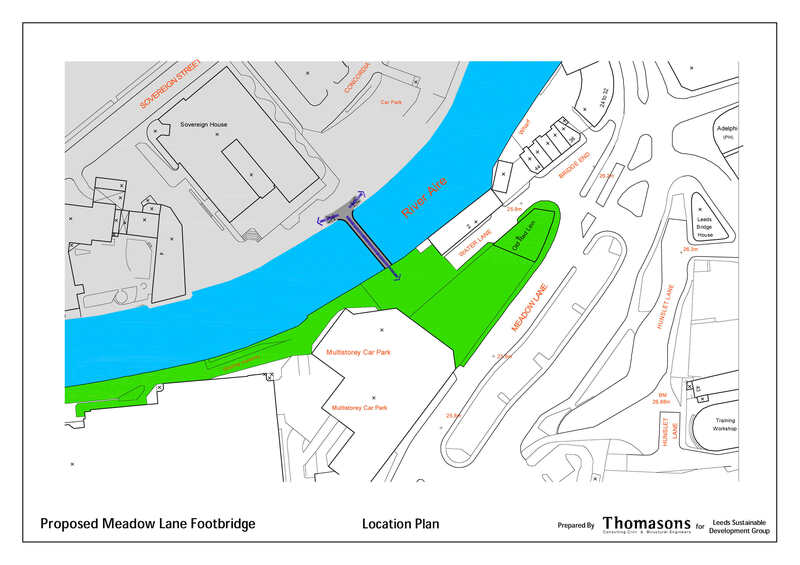 The drawings below show the proposed new footbridge. 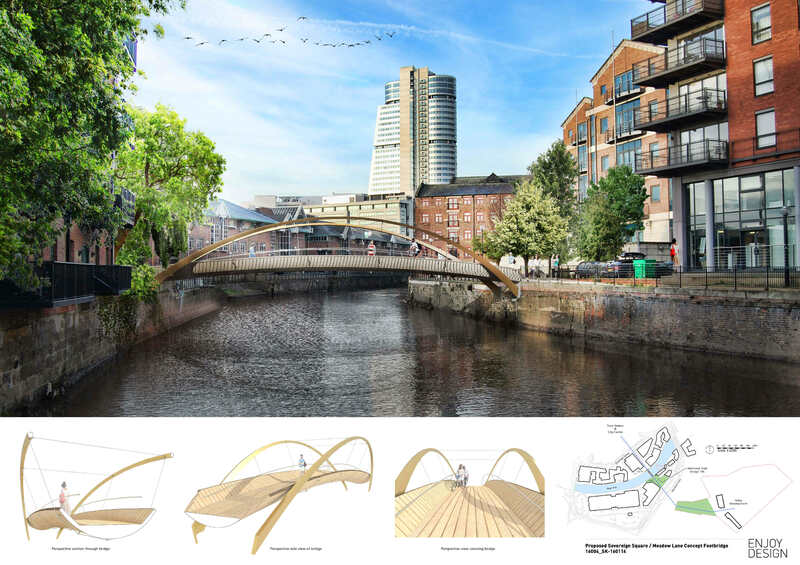 The design shown is intended to be attractive but also affordable and easy to integrate with the river wall alterations now under construction for the new Leeds flood defences. The potential for integrating the bridge southern approach with the David Oluwale Memorial Park, to the benefit of both projects, has been discussed the promoters of the park. A through-arch bridge design has been chosen to (a) make the bridge ‘attractive to the eye’, (b) give clear approaches for pedestrians, (c) minimise the space occupied on each bank and (d) keep the level of the bridge landings as low as possible while at the same time minimising obstruction to water flow when the river is high. With some smart railings and well-chosen colour scheme it could add to the riverscape. The bridge dimensions have been based on a maximum gradient of 1:12 for pedestrians and also provide the same headroom for boats passing below as the adjacent Leeds Bridge. A flatter gradient would raise the height at landings and greatly extend the length of access ramps, which might be difficult to accommodate within the available space. A 4m wide deck has been assumed, to allow for shared use by pedestrians and cyclists if required. The steel arches span between abutments formed in mass concrete behind the existing river walls and supported on piles. If a simple approach to procurement is adopted, the estimated design and construction cost for the bridge shown is £400-450,000+VAT. The design shown has been prepared to demonstrate that the project is feasible and a suitable and attractive bridge could be constructed for a relatively modest amount of money. If desired, at higher cost the bridge could be made wider or a more stylised design adopted. Alternatively a more elaborate ‘iconic’ design could be proposed but the cost would probably be considerably higher. Temple Works – what next?